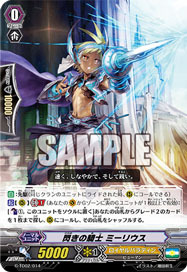 [A] [(V)]: [(2), Discard a "Cosmo Healer, Elgodiel" from your hand to the Drop Zone] When this hits a Vanguard with an attack, you may pay cost. If so, choose a card in your Damage Zone and Heal it. Come, shine of life! Fall, Cosmo Healing Rain!